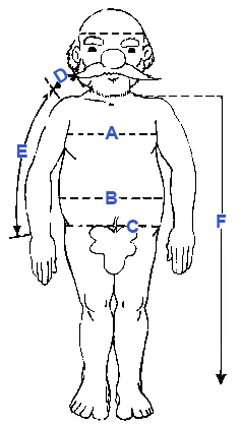 Chest: Measure just under the arms and across shoulder blades holding tape firm and level. Women measure at the fullest point of the bust and across the shoulder blades holding tape firm and level. Belts: Measure in inches around the outside of the waistband of trousers that fit you well. Footwear: Give sizes and width of dress shoe and / or enclose outline of bare foot. Hold pencil straight up when tracing foot. Also advise type of stockings you plan to wear.